Next week, Apple will begin rolling out new map data as part of the iOS 12 beta. The company, which provided an extensive preview to Matthew Panzarino at TechCrunch, has been rebuilding its map data from the ground up, relying on its own data collection instead of third-party providers. In addition to a beefed up GPS rig on the roof, four LiDAR arrays mounted at the corners and 8 cameras shooting overlapping high-resolution images – there’s also the standard physical measuring tool attached to a rear wheel that allows for precise tracking of distance and image capture. In the rear there is a surprising lack of bulky equipment. Instead, it’s a straightforward Mac Pro bolted to the floor, attached to an array of solid state drives for storage. A single USB cable routes up to the dashboard where the actual mapping capture software runs on an iPad. Essentially little slices of vector data that represent direction and speed transmitted back to Apple completely anonymized with no way to tie it to a specific user or even any given trip. It’s reaching in and sipping a tiny amount of data from millions of users instead, giving it a holistic, real-time picture without compromising user privacy. The new map data is being rolled out in the US first. 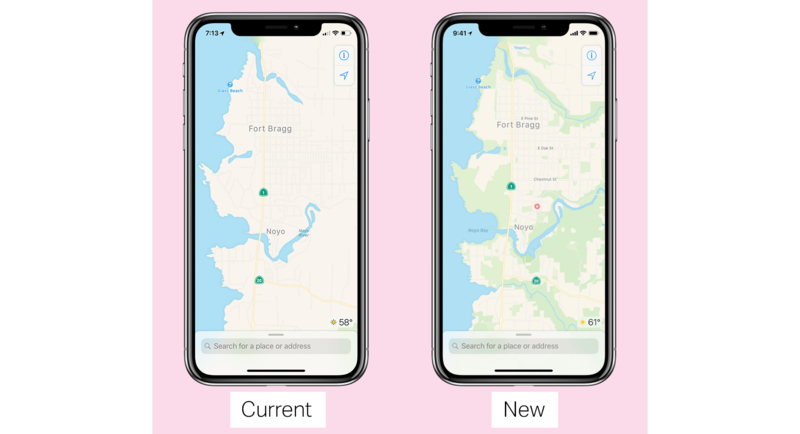 Apple says that data will be seamlessly integrated with existing map data beginning with the next beta release of iOS 12, which is scheduled for next week. The first region to get a refresh will be Northern California, with new areas added throughout the US over the course of about a year. The result should be more accurate, frequently updated maps that do a better job reflecting points of interests, topography highlights, and other details that aren’t present in Apple Maps today. Judging from the screenshots in Panzarino’s article, the changes should be noticeable and useful, though the design of the app itself is not changing during the rollout of the new data.